To wed in Rome is to choose one of the world’s most unforgettable marriage destinations. 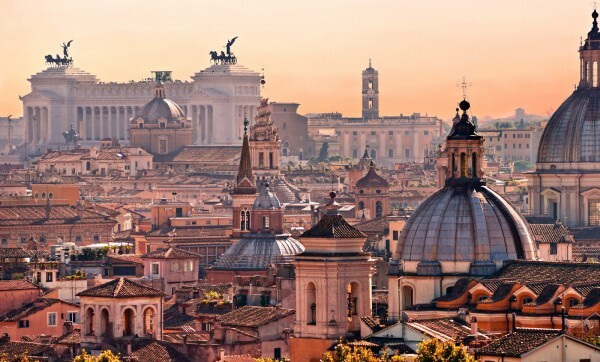 As the Romans say: “Roma, non basta una vita!”, Rome, a lifetime is not enough! For hundreds of years Rome has been the fulcrum of history; you will be overwhelmed by the splendor of your surroundings. Best of all, Rome retains an intimate atmosphere; its historic center can be explored on foot and does not intimidate the first time visitor. Discover its secrets wandering on ancient, cobbled streets. Be surprised by its squares and ancient ruins; a delight not to be missed! A destination wedding in Rome offers something for every budget and style. It is the only city with three civil wedding halls and of course the widest selection of churches and basilicas in the country. On the shores of the Tiber, in the historic Jewish ghetto a beautiful Synagogue is available for a Roman Jewish ceremony. Couples wanting to plan an Orthodox or Protestant rite in Rome can choose from a selection of ornately decorated churches. Best of all, the backdrop to your celebration will be the Roman Forum, the sprawling piazzas with magnificent spouting fountains and romantic gardens of the Capital city. Can there be anything more spectacular than the Colisseum as a backdrop for your wedding photos? Piazza Navona, the Pantheon and the Capitoline vie for first place in spectacular stages for a photographic masterpiece. Receptions in Rome offer a dizzying variety whether your choice is to dine in a 200 year old restaurant on the Appian Way surrounded by Roman ruins or a private Baroque Palazzo with breathtaking gilded interiors. Imagine you and your guests at sunset on a rooftop terrace enjoying the entire Roman panorama while sipping on a Champagne cocktail! It is a sight that will remain etched forever in everyone’s memory. Rome’s variety means that a perfect fit is possible regardless of whether you are eloping to Rome without too many frills or wanting to plan a 3 day celebrity event. The geographical advantages of the capital are obvious: easy access to a major airport and the ideal spot to start exploring the rest of the country for an Italian honeymoon! Our couples cannot say enough about their Roman wedding experience! Come to Rome to celebrate the wedding of a lifetime.